We had been recruiting participants for the summer institute as a team for more than six years, and yet each year was the same. Like clockwork, we grew anxious as the fall semester rolled into the spring semester, knowing that the demands of summer institute recruitment would soon be upon us, colliding with our teaching duties. 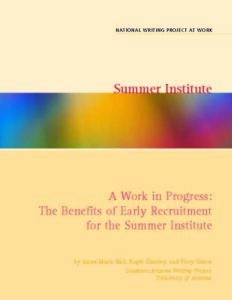 At first we could think of only two reasons that our recruitment wasn’t working: either our summer institute was not worthwhile or our recruitment process was not effective. We knew our summer institute, based on the National Writing Project model of teachers teaching teachers, was a success. That left recruitment: we were doing something wrong in getting our message out. So finally we decided to try recruiting early. Our primary reason was simple: we needed participants. And our initial plan was equally simple and embarrassingly reductive: recruit in the fall. Our first step, however, was drastic: we changed the application deadline—moving it from April to the preceding December—to get a better pool of nominations and to create a sense of urgency around the applications. Our best recruiters, we have learned, are the teachers from the most recent summer institute, whose enthusiasm is at its peak right after the summer. When we recruited in the spring, we felt we had not been making the best use of the new teacherconsultants. In the spring, even when we made personal calls and wrote letters to them, the demands of teaching had created a distance from the writing project and lessened their enthusiasm about recruiting. With early recruitment we would be asking for nominations in the late summer and fall.